As you see, the word itself refers to three angles - a reference to triangles. In its geometry application, it is mainly used to solve triangles, usually right triangles. That is, given some angles and side lengths, we can find some or all the others. 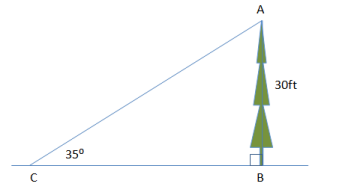 For example, in the figure below, knowing the height of the tree and the angle made when we look up at its top, we can calculate how far away it is (CB). (Using our full toolbox, we can actually calculate all three sides and all three angles of the right triangle ABC). In a more advanced use, the trigonometric ratios such as as Sine and Tangent, are used as functions in equations and are manipulated using algebra. In this way, it has many engineering applications such as electronic circuits and mechanical engineering. In this analytical application, it deals with angles drawn on a coordinate plane, and can be used to analyze things like motion and waves. and when graphed might look something like the wave below. The values of a,b and c determine the wave's amplitude, frequency and phase shift.